Livestrong is website for celebrity cyclist Lance Armstrong’s (Lance stepped down from LiveStrong as of 10/16/2012) cancer research/treatment foundation primarily used to raise funds and act as a repository for information on and promotion of the organization. It also serves as a place where cancer patients, survivors, and those seeking information can go to connect regarding the disease too. Mission: To fund treatment and ultimately eradicate cancer. There are sites designed for 27 different countries, but all are primarily in English (even in non-English speaking countries). 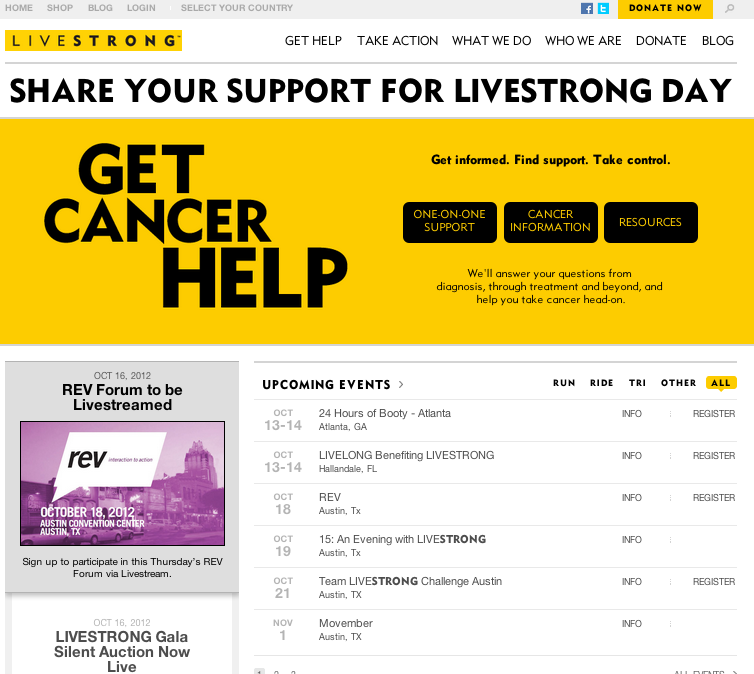 Livestrong has recently undergone a redesign to minimize the clutter on the homepage and the design lends itself to quickly directing traffic to their desired location. There are 3 core components: 1) Donate button front and center, 2) Informational Navigation with only 3 buttons center right, and 3) Events: Below #1 and #2, but still highlighted. There is almost an infographic feel to the homepage with large shapes and designs to highlight graphical information. There are other design elements used to minimize lesser functions of the site, such as merchandise. The audience appears to be anyone interested in cancer research, treatment, and Lance Armstrong. Directly raise money through the “Donate” functionality as well as ancillary revenue streams such as merchandise. The upper right navigation of the homepage has prominent links to their social channels, and these are also highlighted on its blog. 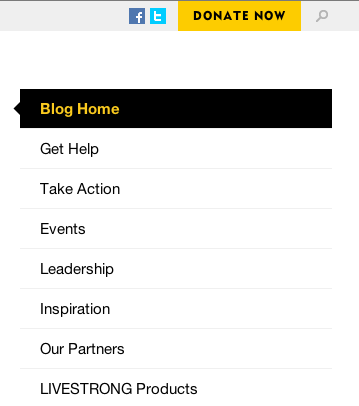 Livestrong has a blog powered by WordPress (view source), was designed using primarily CSS, and there is a shopping cart (donate). Jane wants to understand cancer. Jane clicks on Get Help and then looks at the Physical Effects under Learn about Cancer. Jane is overwhelmed by the list and somewhat demoralized. So she clicks back to Learn about Cancer and finds Survivor Interviews. Watching the videos and reading the transcripts make her feel better, less alone. She identifies with one woman in particular and finds hope in her story. She bookmarks the site to come back to again and sleeps a little better that night.